Some of this can be accounted for by the number of deaths—twelve vs. six—and maybe some of it by the theatricality of the Batman murders. But I think some of it has to do with the fact that the people who shape discourse in this country by and large aren’t Sikhs and don’t know many if any Sikhs. They can imagine their friends and relatives—and themselves—being at a theater watching a Batman movie; they can’t imagine being in a Sikh temple. This isn’t meant as a scathing indictment; it’s only natural to get freaked out by threats in proportion to how threatening they seem to you personally. At the same time, one responsibility of journalists and pundits is to see things in terms of their larger social significance. And it seems to me that the Sikh temple shooting, viewed in that context, is at least as frightening as the Aurora massacre. This was violence across ethnic lines, and that kind of violence has a long history of eroding and even destroying social fabric. The whole thing is worth a read. Also, a question for commenters: Is Wright’s observation equally true for television? 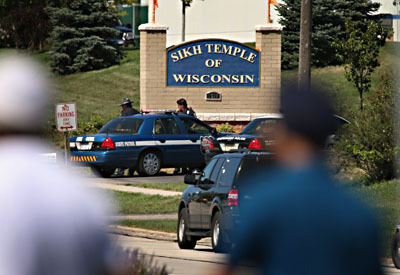 Has the coverage of the Sikh temple massacre on Fox and CNN and MSNBC been lighter than it was for the Aurora massacre? I don’t watch enough TV to have a good idea.